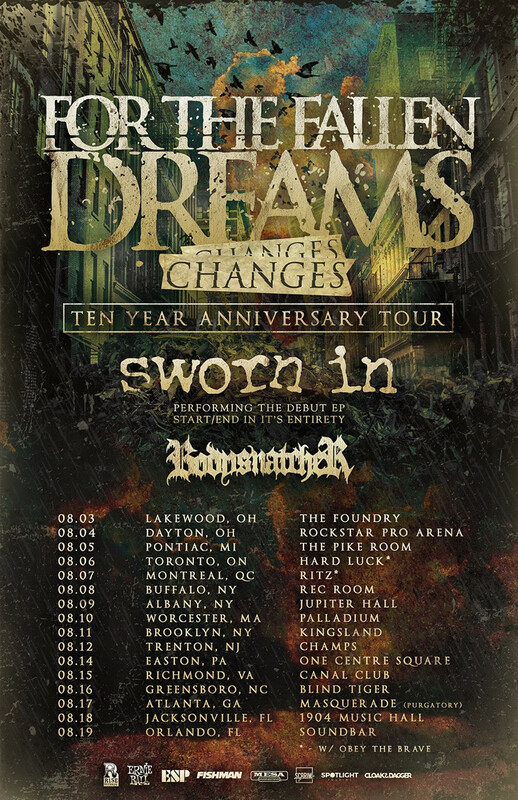 For The Fallen Dreams have announced their Summer 2018 tour plans. The band will hit the road for a North American trek, which includes stops in Canada, this August. The dates marks the first leg of the Changes tenth anniversary tour. The band's album of the name dropped in 2008. 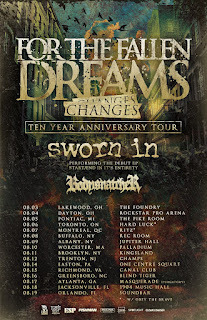 To celebrate, For The Fallen Dreams will perform "Changes" in its entirety. The trek will also feature Sworn In, who are celebrating the fifth anniversary of their "Start/End" EP. The band will perform the EP in its entirety on the tour. Also performing will be Bodysnatcher, who jump on the tour on the fourth date. Stay Sick Recordings artist Sleep Waker will appear on the first three dates Bodysnatcher's stead. An additional support act will be announced shortly. Confirmed dates are below.